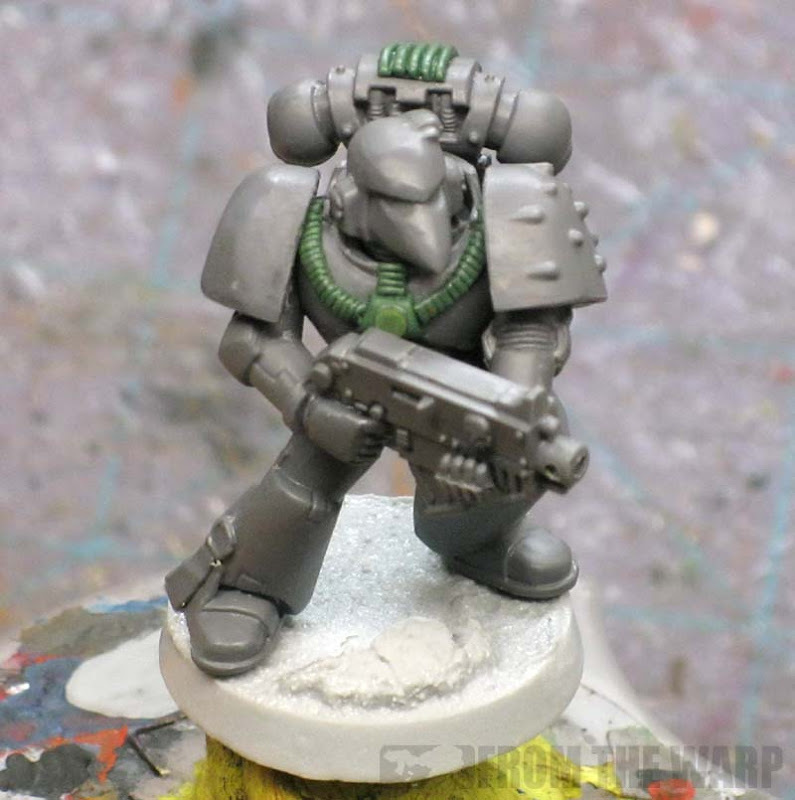 When I was making this model, I decided I would try to do a few conversions to a regular Space Marine model (using parts from the basic Tactical squad box only) to get a more accurate MK6 armour pattern. I wanted to keep it as simple as possible and still get the most bang for my buck. Most of this conversion comes from using specific bits already available. The classic "beakie" helmet and studded shoulderpad were perfect for this. I chose the legs without the articulated knee pads as well. The solid piece greave is another one of those MK6 identifiers. Like I said, I wanted to keep this one simple. The right shoulderpad has had the trim carefully shaved away. The chest piece has had it's iconography cleaned off as well. There is one chest piece in the boxed set that has next to nothing on it and that's a perfect one to start with. The other part that is cut away is the cable bundle from the abdomen section. Not counting the cleaning of the right shoulderpad and chest plate, I only needed to sculpt a small attachment to the backpack and a few elements to the chest plate. Let's start with the backpack. Taking a piece of greenstuff and pressing it flat on the backpack provided the base for the ribbing. I cut the ends away at the correct lengths and then pressed a series of ribs into it. I did use a little extra to fill in the vent holes usually found across the top of the backside of the backpack. That's just a matter of pressing the greenstuff in until you fill those vents left showing around your new ribbing. The chest plate is the most work of all. I started by using a little bit of greenstuff to fill in the cut away abdomen detail. It doesn't have to be perfect since it will most likely be covered up by the arms and a gun. That and part of the chest cables will cover it as well. To get the chest cables started correctly, I began with the connection box in the middle of the chest. It started out as a blob I flattened out and cut to shape. Once it cures completely, you can work on adding the cables off the sides. The small disc sitting on top of it is a very thin sliver of greenstuff cut from a cured length I had lying on my desk and glued in place on top. The cables are rolled lengths of greenstuff that are placed in position and slightly flattened in place. They aren't round like regular power cables. Once you have them positioned, it's a matter of taking your X-Acto blade and cutting a series of ribs into them along their length. The bottom cable runs from the belt buckle up to the chest connection point. The shoulder cables run from the same connection point up to and over the shoulders. You can taper them off as you get to the top of the shoulder or run them over the shoulder to the backpack connection point. Either way works since they'll most likely be covered by the huge shoulderpads once they're glued in place. There is one more cable that runs from the collar down to the chest connector. It's the hardest one to get in place because of collar itself and it's so short. There are some weird angles there, but it's not impossible. Another bonus is that you won't really see the thing either due to the helmet once it's in place. And that's it, a more accurate MK6 armour conversion. You can sub out the pieces you need to if you're making more. I'm thinking about the legs, but the non-articulated ones work best for this conversion. 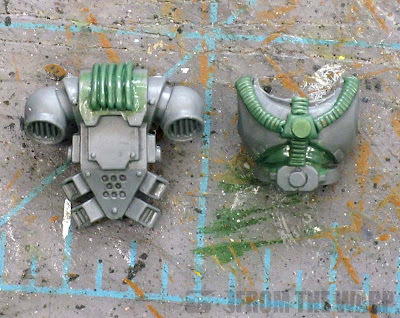 The chest and backpack conversion can be done to any backpack and chest plate that comes in the space marine box. Looks great Ron! My second Favourite Mark. Wow, that looks pretty easy after all. Can't wait to try these tips out, thanks Ron. Should I ever get around to my Raven Guard again, I'll definitely be trying this out. Superb result without too challenging work! While I've always been a fan of "high collar" armor variants, at least back when I've been interested only in Warhammer in general and Space Marines in particular, I must say the conversion looks spot on. It certainly wouldn't look out of place surrounded by Marines built out of the fabled RTB01 box. I think the trick to making a whole squad of these guys would be to cast the front half of the chest piece. It's the most time consuming part of the whole thing and just having those made up would make it much easier to get a squad together quickly. Then you could modify existing backpacks, grab enough beakie helmets and it wouldn't take much work at all. Redscorps: What's your favorite MK then? Perfect conversion,sweet and to the point. As Oink said, Mk4 for me as well. I love the look at it but Mk6 is a very close second. I'd actually have a Ravenguard or Dark Angels army just to have some full suads of Mk6! Anyway enough dribble, great work dude and I can't wait to see the next thing. you are creepy good at the greenstuff, man. 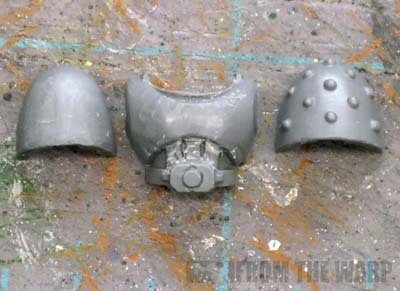 As an addendum to your conversion, I'll submit my article on making studded pads yourself, which, after the cost of the microbeads, will save about $3 per shoulderpad, for the modeler on a budget. vandalworks: I think the one that is similar is actually for the MK5 armour. I'd have to go look to be sure. oink: Big fan of the MK4 huh? That's a good set, but I'm a fan of the 5 if you can get it suitable bulky looking. Redscorps: MK4 for you as well? Beamo: Thanks for the link, that does seem like a fairly simple method that gives some nice results. Your green stuff skills are ridiculous! Kevin: Thanks! But this is a pretty simple conversion in the end and it doesn't take too much work. Not any relevent things here.. just eanted to point ur blog is pretty cool!! glad i found it!! dancing platypuss: Thanks for stopping by! Ron, your fine detail green stuff work is exceptional. I see that you pressed the ribs by using an xacto, how long did you set the 'stuff to cure? Matthew Ochs: Thanks! As for the ribs... I didn't wait at all. As soon as I had it (the cable) in position, I cut the ribs into place.